This edamame and gout page features a little background information about edamame. Mainly, I wrote it to provide a gout food recipe that should help you improve your gout diet. Edamame beans are a type of soy beans. As such, there is evidence to suggest they are good for gout. Specific advice about edamame as a good gout food is limited. However, if you search GoutPal for edamame information, you will find related studies that suggest these beans can help with inflammation and uric acid control. I am still researching this topic and waiting for new information. As we learn more about the health-promoting compounds contained in soy beans. Soy beans are a useful alternative source of protein for gout sufferers who eat too much meat. I don’t expect people to adopt a vegetarian diet, but most gout sufferers will benefit from some switching from animal protein to dairy and vegetable sources. I think it is best to make changes gradually, as this is most likely to stick. Therefore, start by switching from meat once a month, then increase that until you reduce meat consumption to safe levels. This simple, but tasty recipe replaces animal protein with soy protein from edamame beans. The recipe comes from The Enlightened Kitchen by Marie Oser. Rich in health-supporting soy protein and fiber, this delicious medley is an interesting fusion of complementary texture, color, and flavor. If edamame is frozen, cook according to package directions, then drain and set aside. In an electric frying pan, or Dutch oven, heat oil, crushed red pepper, and garlic over medium-high heat for 1 minute. Add onion and bell pepper, and cook for 2 minutes. Add potatoes and carrots and cook, stirring frequently, for 10 minutes. Add edamame, mushrooms, and tomatoes. Reduce heat to medium-low and cook for 8 minutes. Add vermouth, tamari, chives, and thyme, and simmer for 5 minutes, or until potatoes and carrots are tender. 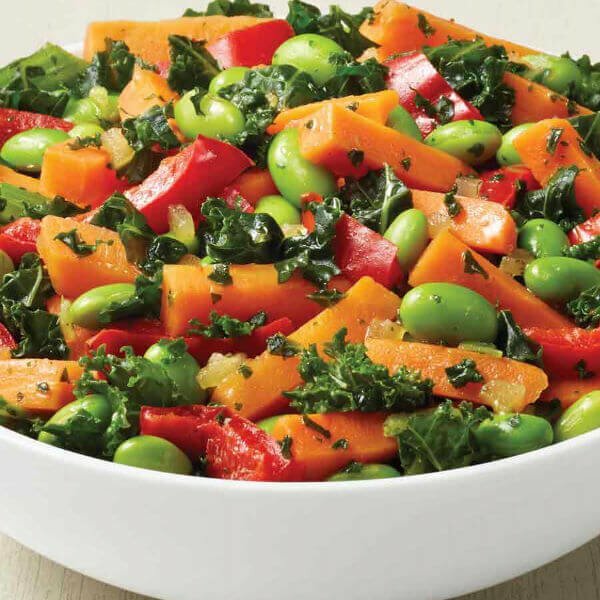 I added kale to this versatile edamame for gout recipe. Try a few simple improvements each week, and soon you’ll be eating healthy, but enjoying your gout food. You can search for more information about edamame. Even better, sign up for the free gout update service and get an email when I publish more facts about edamame and gout. Leave Edamame and Gout to browse more Gout Food.